Post-war camps and hostels – temporary communal accommodation in which most post-Second World War Ukrainian immigrants to the United Kingdom lived in the early post-war years. The first large category of Ukrainians who settled in the UK as a consequence of the Second World War comprised 4,000-6,000 members of the Polish Armed Forces under British command. Those who were already in the country at the end of the war (approximately 1,000 men) lived in military camps, mainly in Scotland. The Ukrainians in the Polish II Corps (approximately 3,000-5,000 men), which was transferred to the UK from Italy in 1946, were accommodated in unoccupied military camps throughout the UK. The Ukrainian members of the Polish forces did not live in compact groups but were scattered between many camps, none of which had more than a few dozen Ukrainian residents. From September 1946 those wishing to remain in the UK began to join the Polish Resettlement Corps. Once employed, they continued to live in the camps until they could find private accommodation. From 1947 responsibility for administering the camps began to be transferred from the War Office to the National Assistance Board, the National Service Hostels Corporation and other civilian bodies, and the camps were officially redesignated as ‘hostels’. When the 8,500 Ukrainian former soldiers of the Galicia Division were transferred to the UK from Italy in May-June 1947 they were accommodated in prisoner-of-war (POW) camps in various parts of the UK, mainly in the agricultural areas of eastern England and southern Scotland. Occasionally the men were moved between camps. In July 1948 the numbers of men in camps at or near various locations were as follows: Hempton (Norfolk) – 1,682 men, Mildenhall (Suffolk) – 1,401, Allington (Lincolnshire) – 1,319, Moorby (Lincolnshire) – 1,264, Botesdale (Suffolk) – 1,010, Dalkeith (Scotland) – 958, Lockerbie (Scotland) – 463, other locations (including hospitals, where invalids were held) – 300. After the men were released from POW status (August-October 1948) and admitted into the European Voluntary Workers (EVW) scheme, the POW camps in which they were being held were taken over by civilian authorities and redesignated as hostels. Almost all of the 21,000 Ukrainian EVWs and their 860 dependants who were brought to the UK in 1947-1950 from continental Europe were accommodated in hundreds of hostels throughout the country. These were of various types, including former military and POW camps, wartime industrial and agricultural hostels and new hostels converted or built after the war. Although the EVW hostels usually accommodated workers of more than one nationality, many of them had sizeable groups of Ukrainians, in some cases numbering up to several hundred. The hostels were administered by organisations such as the National Service Hostels Corporation, the Ministry of Agriculture, the National Coal Board, the YMCA, local authorities and private industrial firms. Initially men and women lived in separate hostels, but married couples were later able to live together or as near as possible to each other. Some EVWs remained in hostels for only a short time before finding private lodgings. Most were able to leave the hostels only after the beginning of 1951, when employment restrictions began to be lifted from those (including the former Galicia Division personnel) who had lived in the UK for at least three years. By the mid-1950s most of the hostels had been closed. Although the camp and hostel residents spent most of their time working in accordance with their employment obligations, outside working hours the Ukrainians, especially where they lived in large numbers, organised a wide range of educational, cultural and recreational activities. In particular, they ran English language courses and held lectures on Ukrainian history and current affairs, maintained libraries and reading rooms, published news sheets, organised choral, folk dance, drama and instrumental groups, practised traditional Ukrainian folk arts (embroidery, wood carving, etc.) and engaged in various sports (football, volleyball, table tennis, chess, etc.). Choirs and dance groups gave concerts in their own and other camps and hostels, and also to local British audiences. Sports teams competed against other camps and hostels and in local amateur leagues. To a large extent the activities were continuations of, or similar to, those which the Ukrainians had engaged in before coming to the UK: in the Rimini POW camp in the case of the former Galicia Division personnel, and in displaced persons camps in the case of the EVWs recruited from continental Europe. In particular, the Burlaka, Slavuta and Dnipro choirs from Rimini, as well as the Rimini camp theatre group, continued to perform after arriving in the UK. Committees were formed to oversee the organisation and running of the activities. These usually consisted of the more active and nationally conscious of the residents, including many who, on arrival in the UK, were already members of organisations such as the Ukrainian Youth Association or the Plast Ukrainian Scouting Organisation, or of various Ukrainian émigré political parties. Visits were occasionally made by representatives of the Central Ukrainian Relief Bureau (to the end of 1947) and the Association of Ukrainians in Great Britain (AUGB). In addition to providing information and advice concerning living in the UK, these organisations gave other types of practical support by, for example, helping to resolve welfare issues, organising the delivery of Ukrainian books and newspapers, and facilitating visits by Ukrainian priests to conduct church services and provide pastoral care. Many of the Ukrainians began to join the AUGB and establish branches of the Association in the camps and hostels (by the end of 1949 there were 242 AUGB branches, each consisting of 12 or more members, and a further 116 smaller groups). The AUGB branch committees gradually took over the running of much of the activity described above. 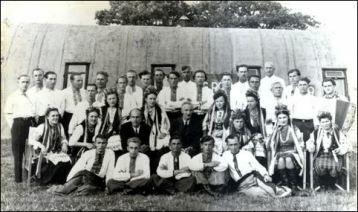 Other organisations which were active in the camps and hostels included the Ukrainian Youth Association in Great Britain, the Plast Ukrainian Scouting Organisation in Great Britain, and later the Association of Ukrainian Former Combatants in Great Britain and the Federation of Ukrainians in Great Britain. Also active were various Ukrainian émigré political parties and organisations. After the closing of the hostels in the 1950s and the migration of most of the Ukrainians to towns and cities, the educational, cultural and other activities were continued in community centres which began to be acquired by the AUGB and other organisations. Although there is now little trace of the camps and hostels themselves, still in use near Lockerbie in Scotland is a hut converted into a chapel by former Galicia Division personnel at Hallmuir Camp, and near Mylor Bridge in Cornwall there is a roadside memorial in the form of a cross built by Ukrainian EVWs from a nearby hostel. Photo: Choir and dance group members at EVW hostel, Bedhampton, South East England, 1947. Virnyi, M., 'Sered rimintsiv', Ukrainska Dumka (London), 9 October 1947, p. 3; 16 October 1947, p. 3.